When you picture MBA internships in the New York City metro, the first thing that comes to mind is probably working at one of the area’s myriad financial services companies. Those opportunities abound, of course, but they’re not the only internship opportunities for MBA students in the NYC metro. 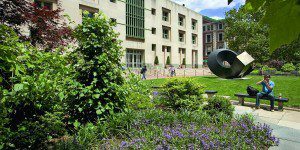 On its website, Fordham University-Gabelli School of Business provides a long list of where its MBA students interned in summer 2015. There are names you’d expect (CapitalOne, Goldman Sachs), but also some you might not, including Major League Baseball. Pace University – Lubin School of Business boasts that its internship program is one of the biggest in the New York City metro. Lubin School MBA students have interned everywhere from JPMorgan Chase & Co. and Ernst & Young to Disney and MTV Networks, according to the school’s website. Not all MBA internships fit the traditional “work at a company, get assigned a project” mold, either. The marketplace lender CommonBond is looking for MBA interns from around the country to launch a startup within the company this summer. And with “entrepreneurship” the top buzzword at many business schools, some students are skipping MBA internships altogether in favor of launching their own companies. If you’re considering going the entrepreneurial route with your MBA, Baruch College and Columbia University have the NYC metro’s top graduate programs in entrepreneurship, according to the Princeton Review and Entrepreneur magazine. Because MBA internships are crucial to a students’ future career success, schools usually provide help to match students with just the right opportunities. At Hofstra University-Zarb School of Business, for example, MBA students are matched with different internship coordinators (including one with a focus on entrepreneurship) depending on their area of specialty.